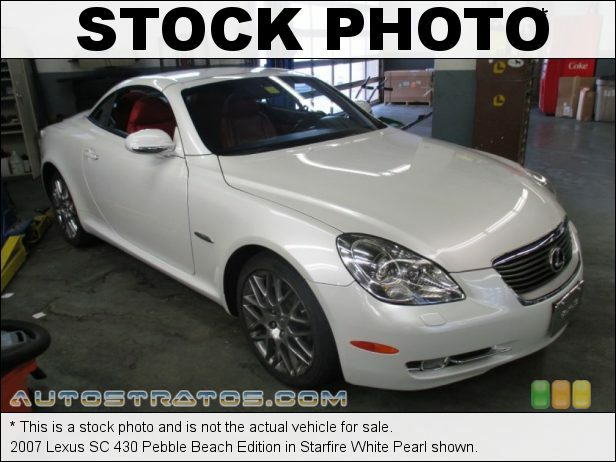 Come see this 2007 Lexus SC 430 2dr Convertible. Its Automatic transmission and Gas V8 4.3L/262 engine will keep you going. This Lexus SC 430 has the following options: Wood-trimmed shift knob, Water-repellent door glass, Warning lights-inc: oil pressure, battery, engine, parking brake, ABS, air bag, door ajar, seat belt disconnect, tail lamp bulb failure, Vehicle stability control (VSC) w/on/off switch, Vehicle speed-sensitive progressive pwr rack & pinion steering, Variable intermittent uniblade front wiper w/mist cycle, Valet lockout functions-inc: trunk, glove box, lower center console box, convertible roof operation, Trip computer-inc: average MPG, current MPG, drive time, average MPH, outside temp, clock, Traction control (TRAC), and Torque-activated powertrain control. Stop by and visit us at Mountain States Toyota, 201 W 70th Ave, Denver, CO 80221.